Handspun 3-ply Shetland in fawn and black. Note that the pattern is worked from the bottom (dark row) after the ribbing, but is reversed from the instep to the toe. 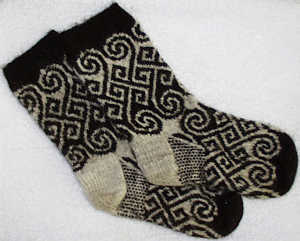 The gauge for the top of the socks is 11 st/inch, and there are 5 pattern repeats. I used smaller needles (size 00) for the foot to make it a bit more snug. The pattern is 20 stitches wide.